Interested in aerial videography with remote control helicopters? Well, you’re in luck! 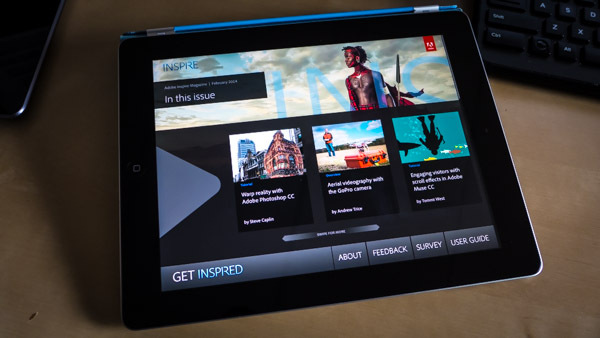 This month’s issue of Adobe Inspire magazine features my article which introduces aerial videography with a DJI Phantom multirotor helicopter and a GoPro camera! You can read it on the web or download the FREE digital publication version to learn more. I recommend the digital publication version, which was created with Adobe Digital Publishing Suite. Interested in focusing on aerial photography instead of videography? Stay tuned for the March Adobe Inspire issue next month, which will feature a complimentary article focusing on still images captured with the same helicopter configuration. Subscribe today to be notified automatically when the new version is available. Be warned – flying helicopters with cameras attached is highly addictive. You may easily become obsessed with the endless possibilities, as I have. Here are a few videos I’ve captured with this setup, and processed with Creative Cloud. OK, do I have your attention yet? To learn more you can read the full article online or download the FREE digital publication, and don’t forget to become a member of Creative Cloud to take advantage of all the creative tools that Adobe has to offer. If you’ve read my blog recently, you’ve probably noticed that I’ve been using a GoPro camera quite a lot lately. Everything from aerial photos, to recording presentations, to recording apps on my devices, to time-lapse videos. I think this camera is awesome! It’s really pretty amazing… While it might seem “bare bones” without a view finder or zoom capabilities, it is very rugged, it takes great still photos (12MP), and even better video (WVGA at 240 FPS all the way to 4K at 15 FPS). It excels in bright light and action shots, and is a very versatile and impressive camera. You can also use the GoPro app on your iOS, Android, or Windows Phone device as a remote viewfinder and controller, which is very cool. 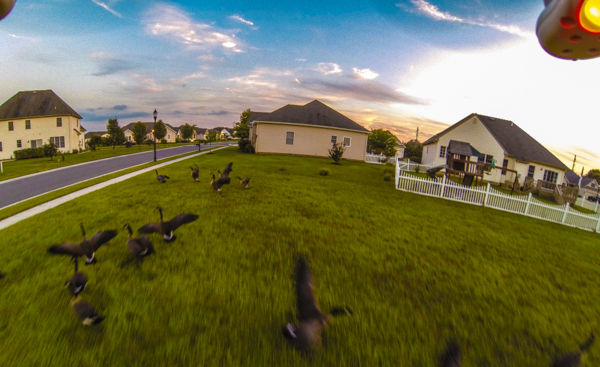 Though the GoPro is not without its quirks/annoyances. Awesome camera. I want multiple of them. For video, either 1080p or 720p video is more than adequate for most circumstances. Audio capture is okay, but it’s better if you have an external mic and can sync audio in post-production. While 4K video is seriously awesome, it kills the battery very quickly, has HUGE file sizes, and isn’t my primary need. Still images look great, although there is significant fisheye distortion from the 170 degree lens. While this looks fantastic in a lot of cases, sometimes we don’t want it… Luckily we can get rid of the fisheye distortion with Photoshop! The camera has some learning curve, but the output is very good, and it is very portable and compact (though, you may end up with more accessories that take up more space). Images and videos look great in decent light, but the camera doesn’t function well in very low-light situations. Must be converted to H.264 or other codec before you can upload them to YouTube successfully, otherwise they “fail in processing”. You can do all the editing and conversion in Adobe Premiere and After Effects. GoPro has their own Cineform video editing software, but I prefer Premiere. If you unplug it from your computer without ejecting, it will lock up the camera. You have to remove the memory card, then remove the battery and reinstall both before the camera will reboot. You can record video while plugged into a power source – However, you MUST start recording before you plug it in, otherwise it won’t let you record while plugged into computer or wall. If you improperly shut down the camera, the most recently recorded video may be corrupt. This can happen if the camera is dropped or jarred from a crash. If this happens, just re-insert the memory card, then reboot the camera. It will go into recover mode, and fix the corrupted file. If auto-recover doesn’t restore your video, you *might* be able to recover the video from the memory card, but there is no guarantee… this has happened to me. The camera does not automatically turn off. You must manually power off the camera when not in use. This can kill your battery unexpectedly if you don’t power off, however you can also change this behavior in the GoPro settings. With the battery pack connected and the “frame” mount connected, you might get a “hum” in the audio – you can reduce this in Adobe Audition, but if you have an external mic, then you don’t have to worry. I’m still not 100% sure if it was the camera/backpack, or something else in the room that caused the audio interference. Let the camera finish whatever it is doing when you are done recording. Don’t force a power-off, otherwise you might lose whatever is in memory buffer on the camera – I know this from experience & recently lost about 20 minutes of video. Opening the waterproof case for the first time is trickier than you might imagine. Once you know how to do it, it’s really easy. Although the camera is supposed to support 64 Gig memory cards, I strongly advise not using anything greater than 32 Gigs. I ran into some issues where the GoPro corrupted a 64 Gig Sandisk memory card to the point that it was unrecognizable by a computer or by the camera. After scouring the web and contacting technical support, I had to replace the card. It turns out the particular camera firmware version was not compatible with the file format for my memory card. Since switching to 32 Gig cards, I haven’t had any problems. 720p, 60FPS, WiFi Disabled, with battery BacPac: Approx 90 mins (though the BacPac was not fully charged) – it is advertised to double battery life. These are more than sufficient battery times for my normal circumstances. Micro SD Memory Card – Required, it does not come with one. I reccommend 32 Gig cards, and get multiple cards so you can quickly swap them in and out. “The Frame” mount – The only mounting option that comes with it is the waterproof enclosure. This isn’t great for presentations b/c you get better audio quality by just having the camera exposed. This also comes with a much needed lens cap. Battery BacPac – Extend the life of the GoPro with a secondary battery, although if you use this, you can’t attach the LCD back. Some sort of bag to put everying in. There are a lot of parts and accessories, although not all of them are essential to carry around with you. Wall Charger – I use an iPad power supply… just plug in the USB adapter to the iPad “wall wart”. LCD Back Panel – I did not get one of these, I was fine just pointing it and shooting. However, you cannot use this with the battery BacPac. My wishlist for the GoPro is that I wish it took higher than 12 MP photos. 12 MP is actually great, but *I NEEDZ MOAR P1XELS*. 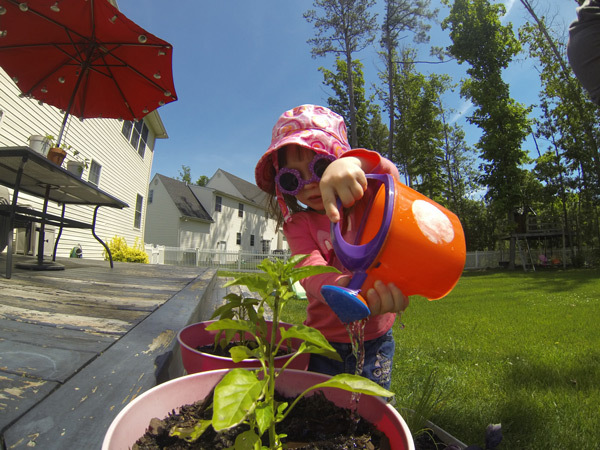 I also wish there was a way to interchange the lens with a non-fisheye lens, but otherwise I love this camera. Yes, I would buy another one in a hearbeat! Last week, new release-candidate versions of Camera Raw and Lightroom were posted to Adobe Labs that feature additional camera and lens support. 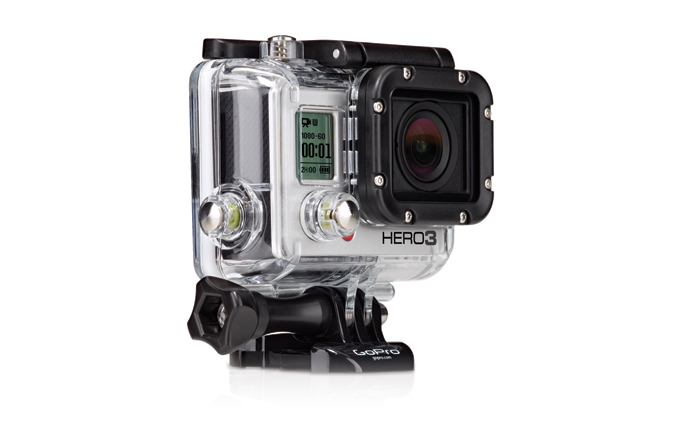 I was extremely excited when I found out that one of the new camera profiles supported is the GoPro Hero 3. 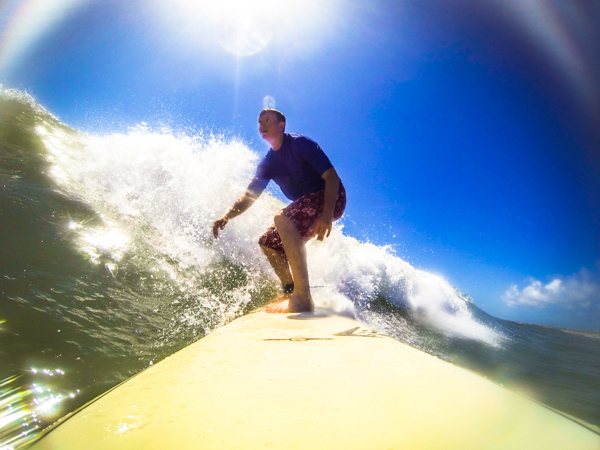 I’m a huge fan of GoPro cameras, and this means we now have more ways to get more creative with their usage. I have a GoPro Hero 3 Black, and I use it in lots of different situations… everything from mounting it to a surfboard, attaching it to a remote control helicopter, mounting it on my car, to weird perspectives snapshots of everyday life. I love the camera, and am always finding new/creative ways to use it. I was recently thinking… I absolutely love the shots I get off of the GoPro, but I wish there was an easy way to reduce the fisheye distortion. I wanted to try my hand at creating some aerial panoramas, but the distortion was causing issues. You can reduce the distortion using Photoshop’s Adaptive Wide Angle filter, but that can be tedious to get right. 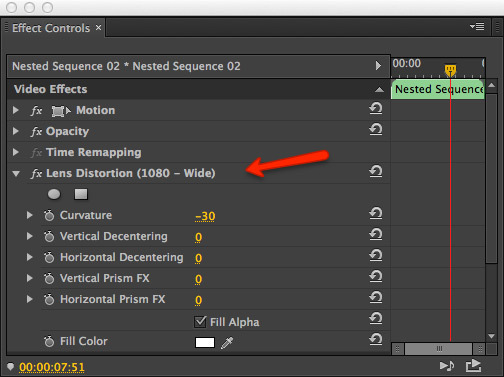 This release makes the process of reducing fisheye dead simple. Reducing the lens distortion is now as simple as selecting the GoPro camera profile in Camera Raw’s lens correction settings, and you can use it to create some incredible images. Check out the video below to see how to apply GoPro lens correction to both images and videos in Adobe Photoshop, Adobe Lightroom, and Adobe Bridge. 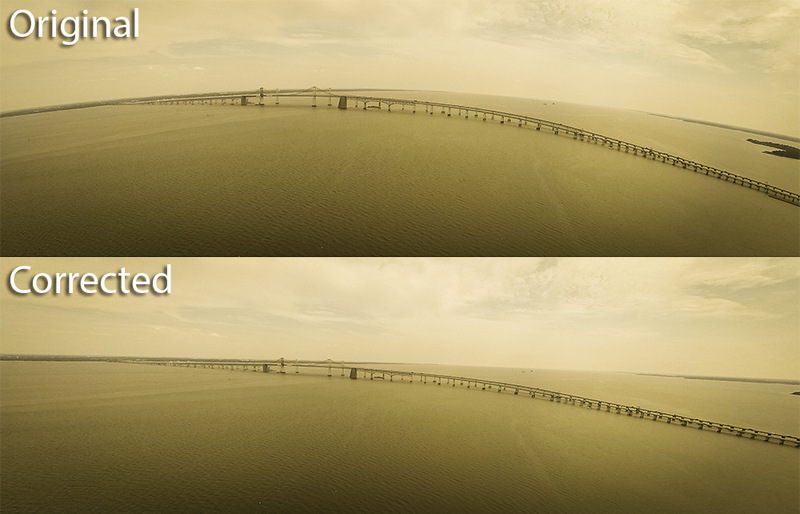 Here are some side-by-side comparisons of before and after applying the GoPro lens correction. I’ve also been able to use this feature to create some awesome (in my opinion) aerial panoramas using the DJI Phantom quad-rotor remote controlled helicopter. The easiest way to create one of these panoramas is to select the images you want to merge inside of Adobe Bridge. Then right-click and select “Open in Camera Raw…”, and then apply the lens correction to all of the images. 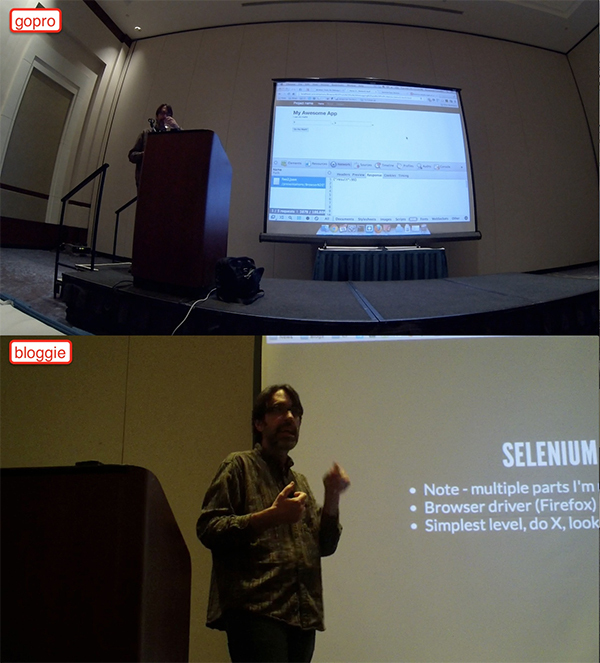 Once you’ve done that, keep the same images selected and go to Tools -> Photoshop -> Photomerge inside of Adobe Bridge. This will launch the Photomerge process inside Photoshop, and after a few minutes, you will have a nice panorama to work with. Take the generated panorama, turn it into a smart object, and then you can start applying other filters (including Camera Raw) to it, and you can achieve some great results. Here are a few panoramas I’ve created. Click on any one of them to view an interactive panorama, where you can zoom into the full resolution of the image. To make the panoramas interactive, I used Photoshop’s “Zoomify” export, combined with the Leaflet mapping library for an interactive HTML experience. You can ignore the HTML it generates, but keep the images and XML configuration file. I then used this open source Zoomify Layer for Leaflet to make the images fully interactive, without any plugin dependencies. You can pinch/zoom and pan the images, and they are loaded as individual tiles, so it’s a smooth experience for the end user. Go get started, and have fun! 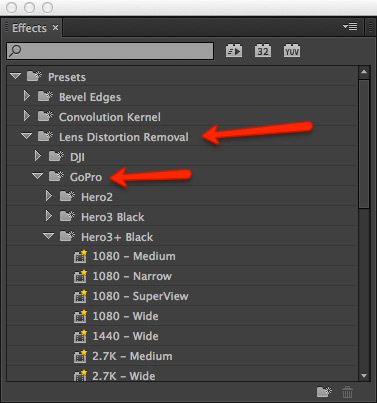 You can download Camera Raw 8.2 and Lightroom 5.2 release candidates from labs.adobe.com – just make sure to get the correct Camera Raw plugin for your suite (CS6 or CC). Have fun and enjoy! Feel free to share any of your creations too!